World History Playing Cards can be used to play literally ANY card game while focusing on content! The Ancient World Full Bundle includes seven ancient world civilizations. The prompts include people, places, and things of the ancient world. This is a fun way to review throughout the year. Students can sort, group, categorize, find relationships between concepts, sequence, build a timeline, as well as play any card you can think of. Two game instructions come with this purchase. Four additional game instructions can be purchased in my store as well. This bundle will give you a total of 91 cards. 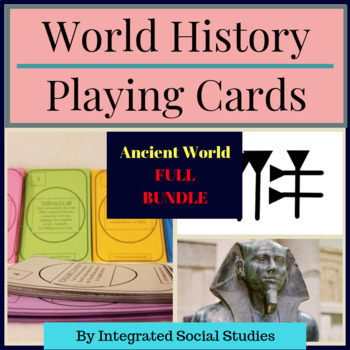 Use all of the cards at once for the ultimate Ancient World card game or use select civilizations in order to more accurately gauge what your students know. Please note: these playing cards are an instruction tool and should not replace substantive, explicit teaching. The cards will not include every possible detail students should know about each civilization and are instead a fun way to assess a little bit of what they know. Keep in mind, I also have a World History Playing Cards: Middle Ages Bundle. Combine cards in two different time periods for a more unique review!